Want a deliciously cute cupcake that lasts forever? 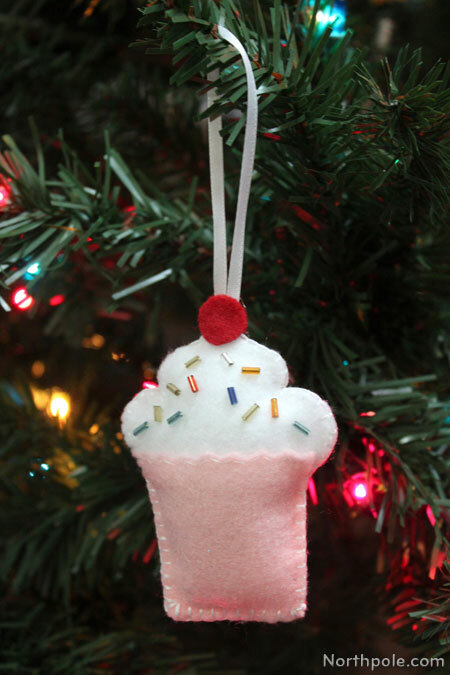 Make this little cupcake ornament, but don’t eat it! 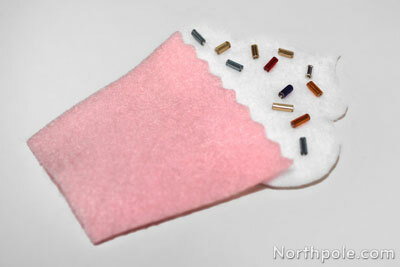 If you want a different “flavor,” simply change the color of the felt and the “sprinkles” to suit your taste. 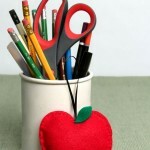 Are you giving someone kitchen items as a Christmas gift? 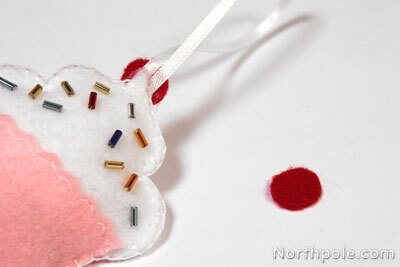 Decorate the package with this petite cupcake. Print the template�and cut out. Trace template piece onto felt and cut out. 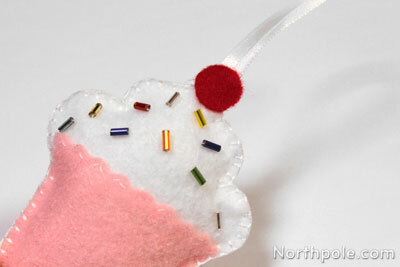 Sew bugle beads onto the each white piece for sprinkles. 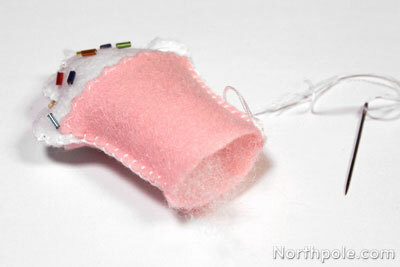 Make the top edge of the pink cupcake bottom wavy with pinking shears. Don’t cut too much—just enough to make the edge wavy. Place cupcake bottom on the frosting. The wavy edge should slightly overlap the straight edge of the frosting. 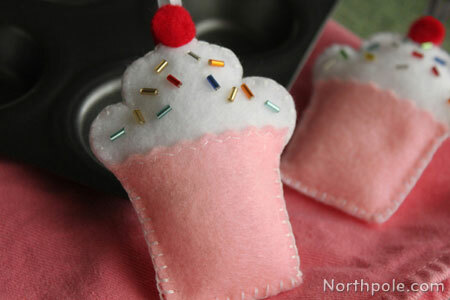 Sew together the frosting on the cupcake bottom. Repeat for remaining 2 pieces. Stack pieces together and begin sewing together. 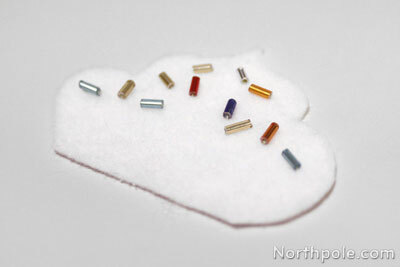 If you like to have thick thread, double up the thread or use embroidery floss. After you’ve sewn about 3/4 around the cupcake, fill with Poly-Fil®. 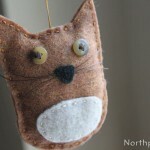 Continuing sewing. 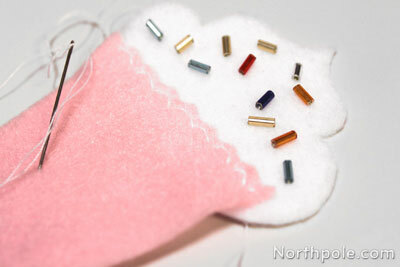 See here for tips on hiding the thread. Cut 2 small circles from red felt that are about 0.5" in diameter. 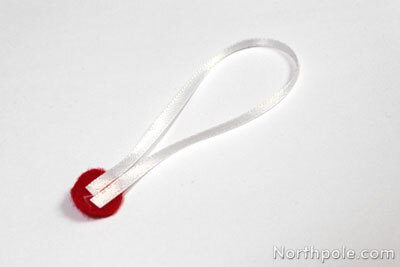 Cut a piece of ribbon that is 6–7" long. 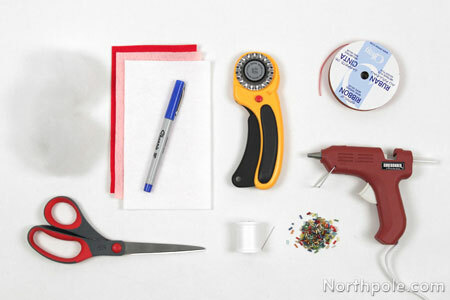 Fold the ribbon in half, and glue the ends onto one circle. Now glue this circle onto the tip of the cupcake. Turn the cupcake over and glue the remaining circle onto the tip of the cupcake. Now your cupcake is finished!